The Vietnamese restaurant. You know, the one that has PHO prominently displayed on their awnings. There's Pho 99, Pho Hoa, Pho Tan, Pho Tam, Pho 101 and so on. Just put "Pho" and you got a restaurant name. 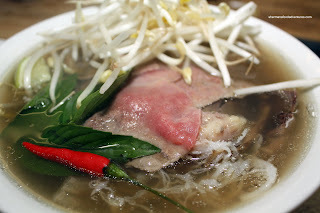 The classic was Pho Bich Nga. Too bad it's gone! 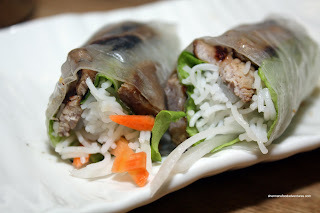 How about a Vietnamese restaurant without Pho in its name? Sure there are a few out there such as Song Huong, Thai Hang, Thai Son and Bao Chau. But there is something a bit different with Mui Ngo Gai. If you ever get a chance to look at their menu, there are dishes that you'll rarely find at other Vietnamese restaurants in town. In addition to the standard pho, rice and spring rolls, there are entrees from the South and hot pot. 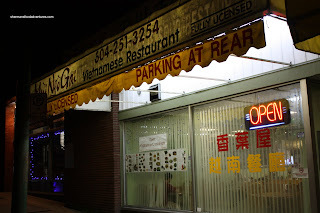 Actually, we weren't planning on dining on Vietnamese food tonight. We were on our way home from the women's ice hockey game at UBC between China and Finland. I was wanting to try Banditas out; but it turns out that they close at 10:00. Thus, I had to find something close and quick. Viola, Mui Ngo Gai! If we had more time, I would've tried some of their specialties. Instead, we ended up with most of the regular items you'd find at any other Vietnamese restaurant. I got one Spring Roll and one Grilled Pork Salad Roll to start. I really enjoyed eating the salad roll. It wasn't exactly big; but there were big pieces of nicely grilled pork with crunchy romaine, carrots, daikon and vermicelli. Not exactly that appealing when I laid eyes on it, the spring roll was much better than they looked. 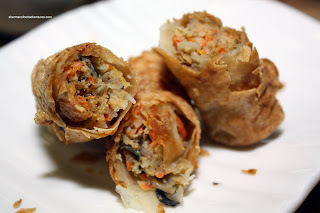 Despite looking hard, the spring roll was crunchy and I did like the filling of meat, carrots, cellophane noodles and woodear mushrooms. Predictably, I ordered a large pho with the works (rare beef, tripe, tendon, brisket). However, if you loo k at the picture, you'll notice it's not a large. Yah, they messed up. Didn't matter though, it turned out for the better since I really wasn't all that hungry. Remember, I already had dinner prior to the game (an early one though). Well, it was a small in theory; but honestly, there was enough noodles and meat to qualify it as a large. It just came in a smaller bowl with less soup. And about that soup, it was good. Definite meat flavour and a nice balance between salty and sweet. Noodles were al dente and the meats were well-prepared. A pretty solid bowl of pho. 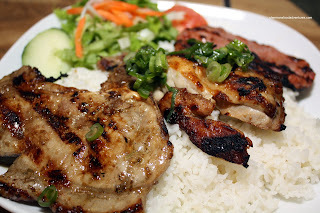 Viv ended up with a rice dish that included grilled pork, chicken and ham. Don't worry, she only ate half. A pretty simple dish really; yet executed properly with nicely grilled meats with a hint of lemongrass. A pretty good bang for the buck at $8.95. Pretty good, another successful random restaurant visit. Food is good, price is right and the owner-lady is quite nice. LOL, yah, you're right. It's part of the charm. I've been to this place twice and finds it a bit cleaner than many other places actually. I was craving Pho and this one was in my area. I thought their soup base was tasty, being non-oily and not too salty. The condiments were fresh. The spring roll was light and crisp and the iced coffee rich in flavour and creaminess. All in all, a nice filling lunch at a reasonable price. Next time, I want to try their real fruit smoothies for only $3.25 each (a steal these days). Their lettuce wrap entrees also sound enticing. As to their interior, I actually appreciated the tropical vibe and photos on the walls. @Holly Actually their menu looks quite diverse, I need to eat something other than Pho there!